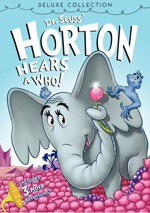 Dr. Seuss’ Horton Hears a Who! appears in an aspect ratio of approximately 1.85:1 on this Blu-ray Disc. Across the board, the movie looked great. With its bright storybook setting, Horton boasted a broad palette. 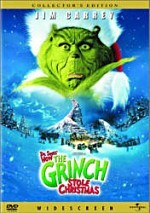 The movie featured a wide variety of hues, and the DVD made them look quite good. The tones seemed lively and full throughout the movie. Blacks were dark and tight, while shadows looked clear and well-delineated. Overall, the presentation was quite strong. Though not quite as good as the visuals, the DTS-HD MA 5.1 audio of Horton also satisfied. The soundfield wasn’t super-active, but it provided a good sense of place. The flick featured enough action-oriented scenes to add a reasonable amount of pizzazz to the package. Most of these stemmed from Horton’s attempts to save the speck and ward off aggressors. Those sequences allowed a lot of information to spread to the side and rear speakers. The elements opened up matters well, with nice localization and integration. While I couldn’t identify any real standout segments, the mix provided a good overall impression. Audio quality always pleased. Speech was natural and concise, without edginess or other concerns. Music showed fine vivacity and depth, and effects also delivered solid presence. Those elements were consistently full and clear; no distortion interfered, and bass response seemed fine. Again, this was a very good mix that worked well for the material. 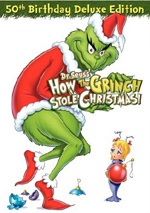 How did the picture and audio of the Blu-ray compare to those of the film’s DVD version? Audio seemed very similar, but the visuals got a nice boost. Though I felt pleased with the DVD’s transfer, it couldn’t compare to the depth and accuracy on display here. The Blu-ray offered a good upgrade in terms of picture quality. All of the DVD’s extras repeat here, and we find one new component. We begin with an audio commentary from directors Jimmy Hayward and Steve Martino. Both sit together for this running, screen-specific piece. They discuss adapting and expanding the source material, cast, characters and performances, music, visual design and animation, and a few other production topics. Obviously intended to help promote the then-upcoming Ice Age sequel, we get a short called Surviving Sid. It runs seven minutes, 59 seconds and shows Sid the sloth as a camp counselor. Slapstick hijinks ensue, with a little amusement as well. Exclusive to the Blu-ray, Watch Horton Hears a Who! With a Who provides an interactive feature. With this activated, JoJo the Who will occasionally appear on screen. He simply watches the film with you and reacts to its events. Sometimes he raises a sign, and that’s the cue for you to hit the red button on your remote to “help” him. Not much comes of any of this; it’s a painless extra but not an interesting one. Under Fox on Blu-ray, we find ads for City of Ember and Ice Age: Dawn of the Dinosaurs. No promo for Horton appears. 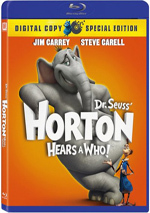 After a few crummy Dr. Seuss adaptations, I had low expectations for 2008’s Horton Hears a Who!. Happily, the flick proved to be pretty entertaining. It remained reasonably true to its source and provided a nice piece of entertainment. The Blu-ray offered excellent picture and very good audio along with a mix of fairly interesting extras. I like this amusing flick and think the Blu-ray brings it home in a satisfying manner.